There are things you can do daily in your maintenance routine to help prevent or slow the formation of a lip. 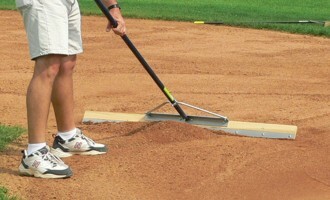 Be sure to use a nail drag no deeper than 1/2″. 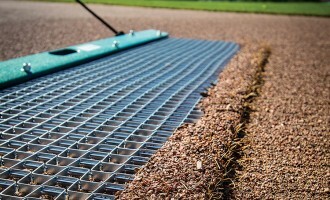 This assures there is not excessive loose material that can easily be pushed over the turf edge by a drag mat or heavy rains. 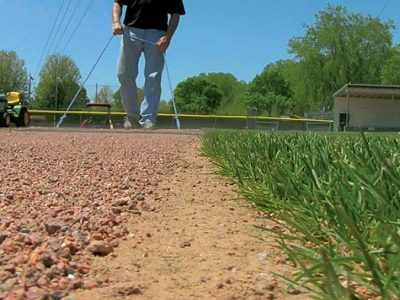 Ideally you will only have 1/4″ to 1/2″ of loose soil or topdressing on your infield skin at anytime. 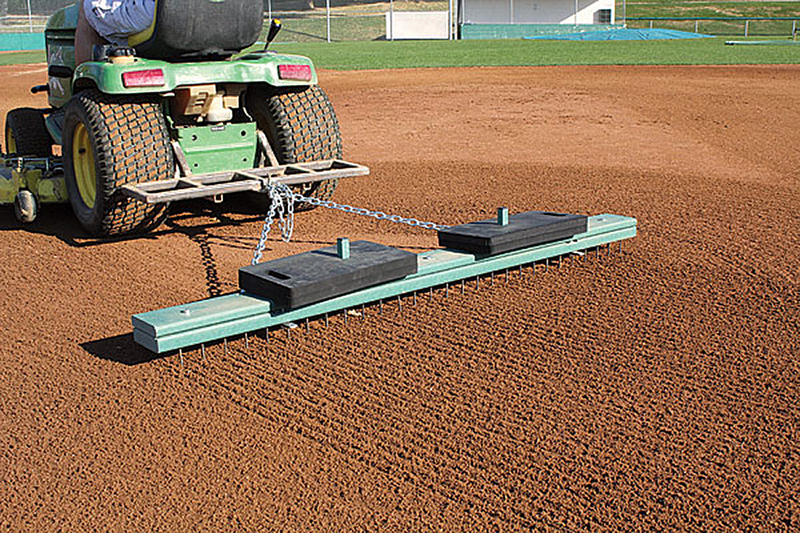 Adjusting the weight of your nail drag for field conditions can help you maintain a consistent 1/4″ to 1/2″ depth. 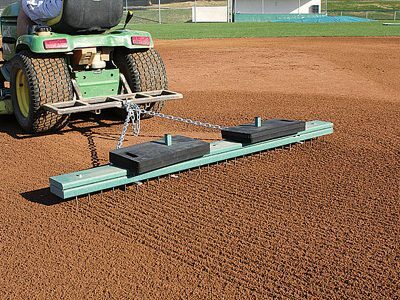 Also, using topdressing is much easier to maintain than just straight soil on your infield skin. 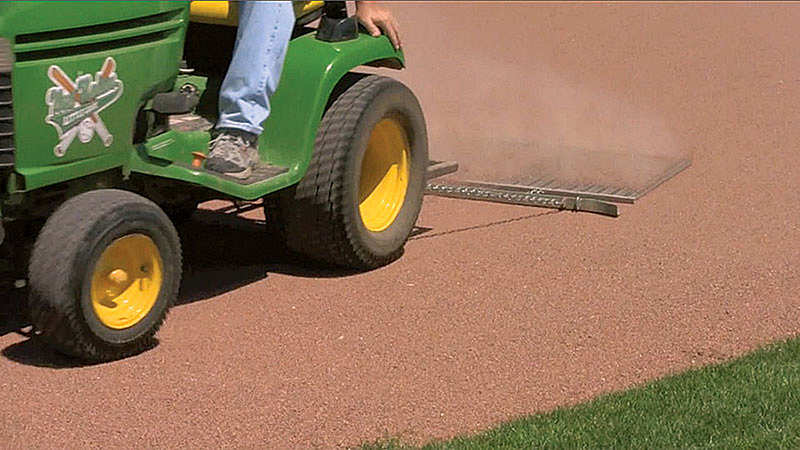 The best way to control the material near your turf edge is to manually drag that area with a hand drag. 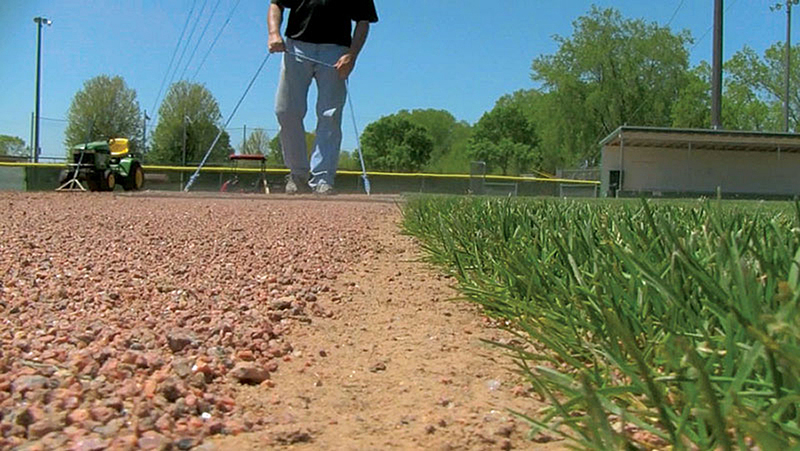 When float dragging your infield with a tractor, you’ll want to stay about 6 inches from the edge to prevent material from getting pushed onto your turf edge. 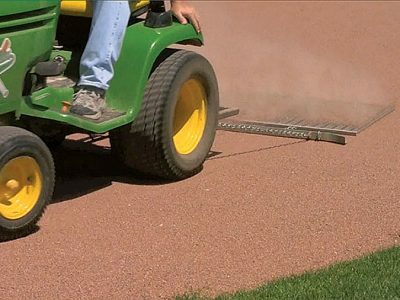 Using a hand drag means you won’t need to get too close to the edge with your tractor. 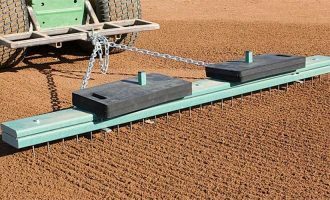 By manually dragging near the edge you will leave plenty of room from the edge for your tractor to effectively drag without pushing material onto the turf edge. 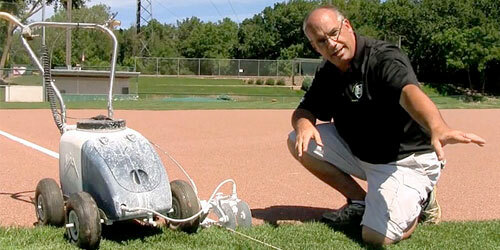 When float dragging your infield with a tractor remember to slow down. 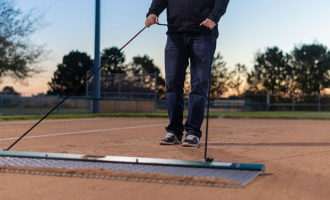 By slowing down — especially when turning — and by hand dragging next to the turf edge you’ll reduce the amount of material the drag will grab and displace from the center of the infield to the outer parts and the turf edge. 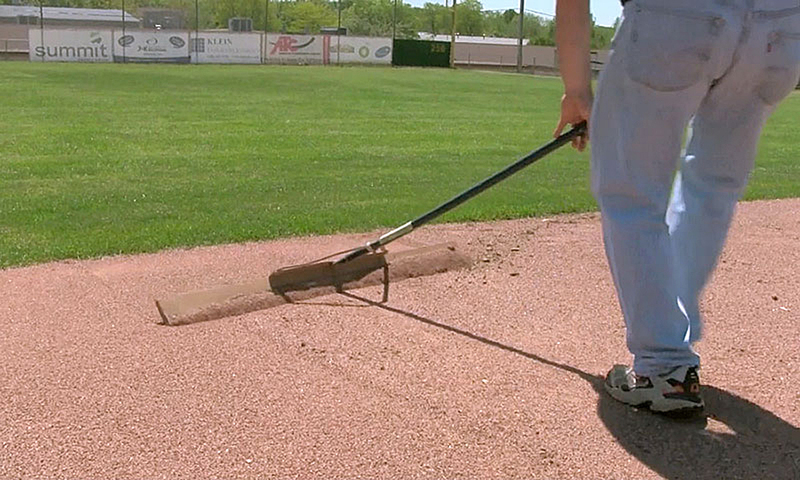 Obviously, infield soil tossed outward by a drag can lead to the buildup of a lip. 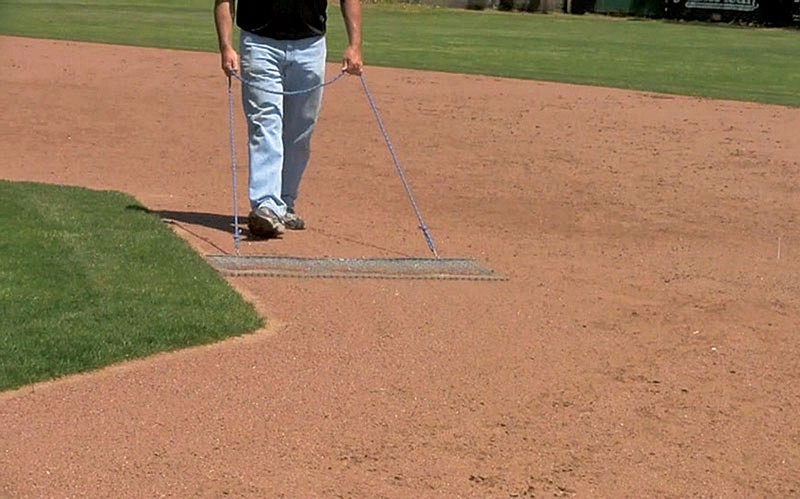 In addition, if you are dragging too fast, the displaced material from the center will not only lead to a lip, over time it will also create a bowl effect in your infield. This giant low spot will hold water, create puddling, and will have trouble draining after a rain. 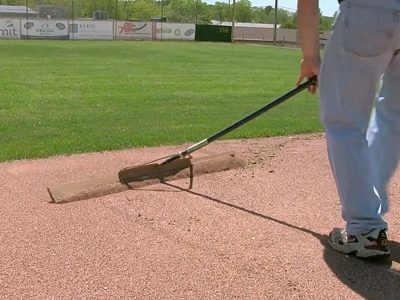 With most infields sloped slightly toward the back for better drainage, there is a greater chance that infield material will slowly migrate toward the back turf edge over time. 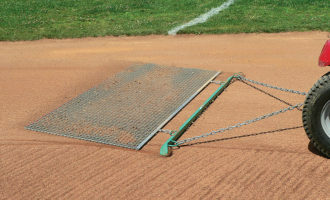 Whenever it rains water runs off the infield toward the back as planned — only with the water comes some of the infield soil and topdressing. High winds — especially in the winter — can have the same effect. The result is a natural migration and another factor with how a lip is formed. 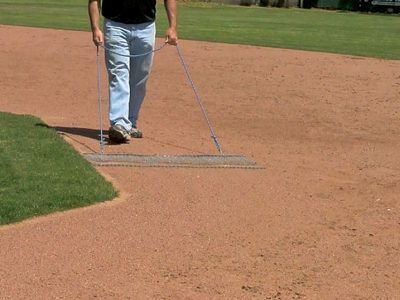 In order to stop this slow progression, periodically pull material away from the turf edge toward the front of the infield skin. 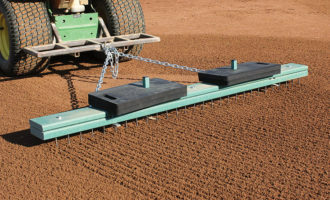 A level board or lute scarifier are perfect tools for this, and how often this needs to be done depends upon how frequently you have high winds or heavy rains. You now have the information you need for managing — and hopefully avoiding — lips. There’s one more Pop Quiz for you to make sure you’ve retained the most important points. Log in to take the quiz before you move on to another module.